Raw and potent, the first We the Animals trailer is here. Most cinematic coming-of-age tales seek to warm our hearts, break our hearts or indulge in a little bit of both. We the Animals looks to warm our hearts while breaking us at the same time, only to repeat this process many times over as the family that is the subject of the film rides a constant rollercoaster of emotions. A father loves, a father protects, but, also, a father leaves. Brothers look out for one another, they laugh and play, but they also fight—humans are flawed beings and the human condition is a fractured quilt, stitched of numerous emotions that all threaten to come apart, unweaving the very fabric of one’s being. Three brothers, all young, are the core subjects of We the Animals, and how they deal with love, imagination and adversity is at the core of the film and its first trailer. Three brothers blast through their childhood with magically realistic glee while the encroaching fog of their parents’ volatile relationship seems to strip them of their youth, far before any boy should have to grow up. In the course of the trailer, childhood loses—the boys resort to shoplifting for food once their father leaves and, in a striking moment of all-too-real desperation and sadness, one of the boys keeps cool by sitting in the family’s open refrigerator. But childhood also wins: The three brothers sprint through the woods, hollering and laughing; they ride bikes into a pond and they joke with one another. The oldest brothers, Manny and Joel, seem to grow up too fast as Jonah, the youngest of the trio, is almost forcibly kept from growing, from spreading his wings. The mother keeps him close, keeps him young and even says, on the cusp of Jonah turning ten, “Promise me you’ll stay nine forever. You aren’t ten, you’re nine plus one.” It is equal parts understandable and discomforting. 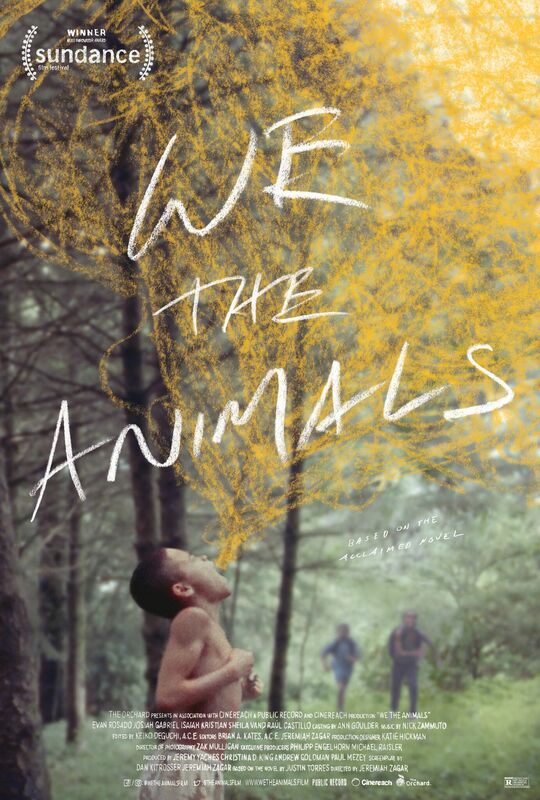 We the Animals looks to be an immersive and viscerally real portrayal of a working-class family, and the emotional ebbs and flows of childhood, of what happens when a boy (or boys) faces the precipice of burgeoning masculinity. We the Animals is directed by Jeremiah Zagar (his first narrative feature), based on a screenplay by Zagar and Dan Kitrosser. The screenplay is adapted from the novel of the same name by Justin Torres. The cast includes Evan Rosado, Isaiah Kristian, Josiah Gabriel, Sheila Vand and Raul Castillo—this film is each child’s first foray into acting. We the Animals debuted at Sundance, where it tied for the NEXT Innovator Award. The film arrives in a limited theatrical release on Aug. 17 via The Orchard. Check out the striking trailer and the film’s poster below.